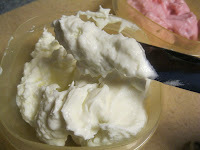 Making a super creamy "Cream" cheese is easier than you think! 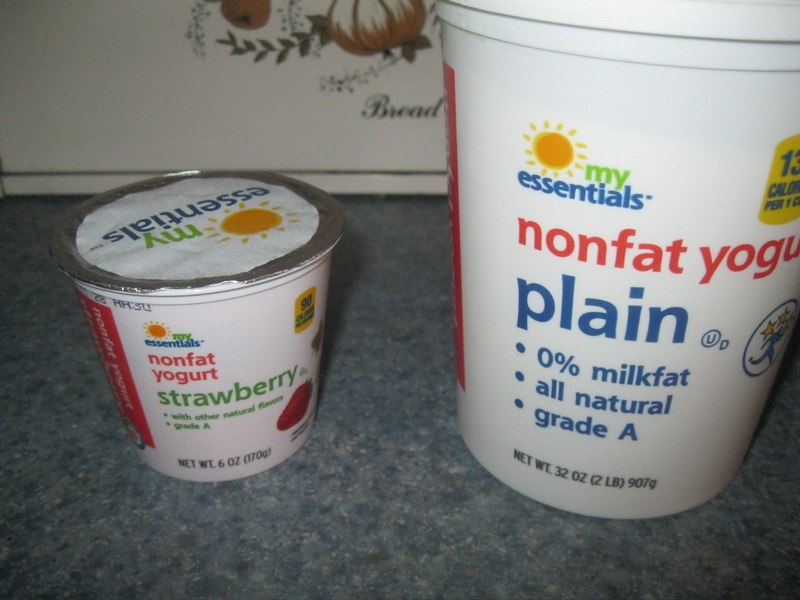 Although this version is not a true cream cheese, since it is yogurt based and not cream based, you will find it to be a great alternative both in cost and calories! 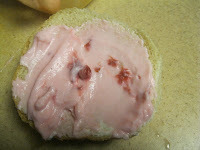 Yogurt cream cheese can be a little more tart than your used to with traditional cream cheese, so keep that in mind. Also the thicker the yogurt the better. 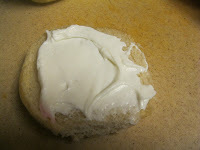 My family prefers the flavored yogurt cream cheese over the plain for smearing on a bagel, but I do use the plain yogurt cream cheese for cooking and baking. It's less expensive and the family doesn't even realize it. One 32 oz. 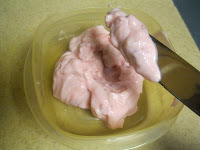 plain yogurt should make about 2 cups of cream cheese. The small 8 oz. yogurts will make about 1/2 cup. (Perfect to make the night before and have for breakfast in the a.m.) You could try the vanilla yogurt instead of plain, if you'd like a bit smoother in flavor. There are two slightly different ways to make it. 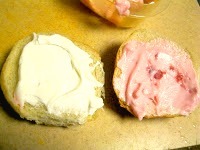 I made the strawberry cheese one way and the plain the other. Place a strainer inside a bowl. You'll need a double layer of cheese cloth. 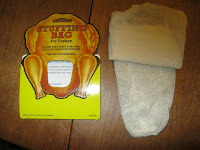 I found that Dollar Tree had cheese cloth bags for holding turkey stuffing in the same aisle as the aluminum foil pans. I bought two so I could double the bags inside each other for a double layer, they worked PERFECT for this! Plus I love that you can wash them and reuse them! Spoon your yogurt (mine was plain yogurt) into the bag. Jan's tip: When you remove the lid from the yogurt, if you see any liquid whey at the top , don't stir it back in, drain it off. Sometimes that yellowish liquid is there and sometimes it's not. Tie the bag closed with a piece of yarn. Some people choose to hang their ball of yogurt either from a wire rack in the fridge with a bowl underneath to catch the whey that drains. I have a new fridge (yea!) and no wire racks So I placed mine in the strainer that is sitting in a bowl to catch the whey that drains off the yogurt. 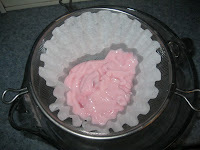 So... place your ball of yogurt in the strainer/bowl and place it in the fridge overnight. Want to see something cool? 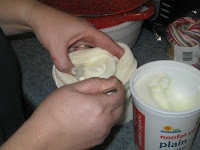 The second you put the yogurt into the cheese cloth the whey starts to separate. if you look carefully at the picture below, you will see at the bottom of the cheese cloth ball small drops of the whey coming out. this was taken within a minute of me putting the yogurt in the bag. In the morning, turn the cheese cloth bag inside out and scrape the ball of cream cheese into an airtight container with a lid. 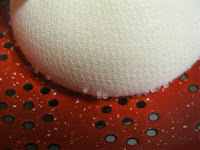 Use a spoon to scrape off the cheese from the cloth. Throw out the whey that collected into the bottom of the bowl. 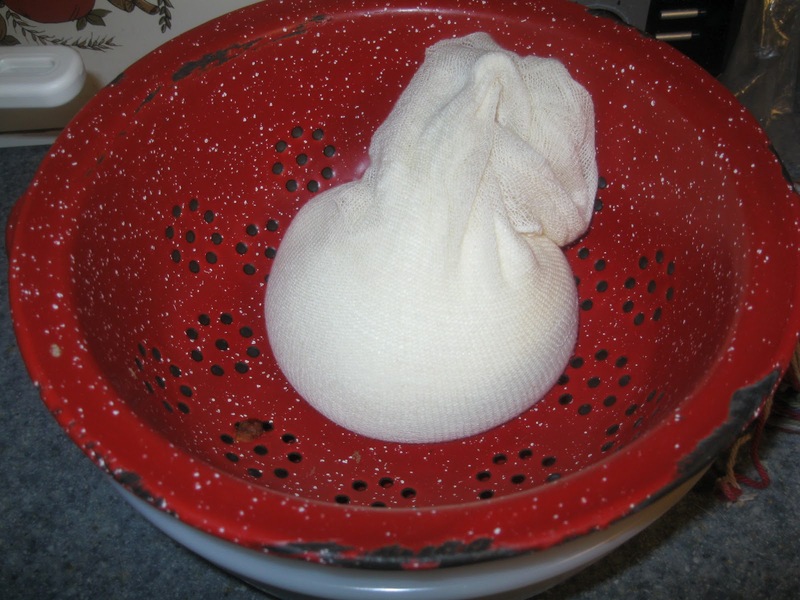 Wash the cheese cloth to reuse another day. 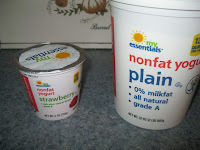 I like to use this method for the smaller containers of yogurt. It works great! It is basically the same above. Place a strainer over a bowl. 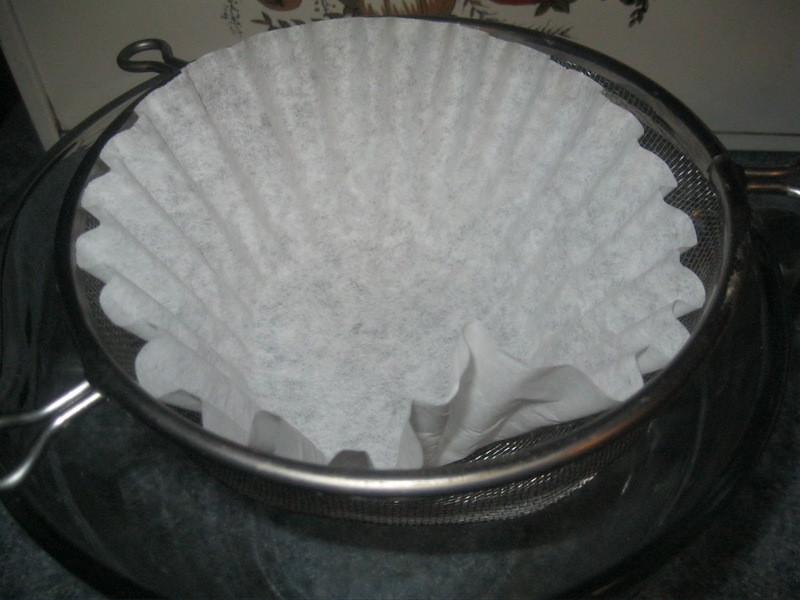 Line the inside of the strainer with a coffee filter. 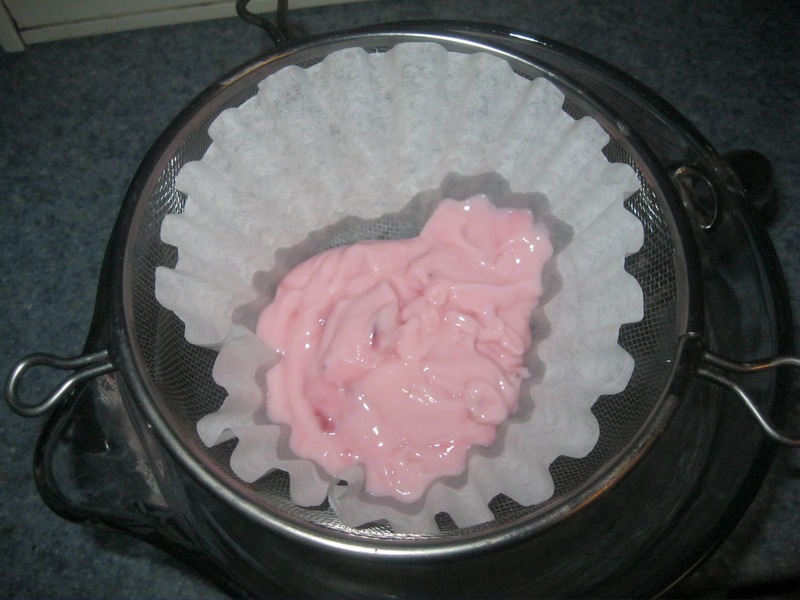 Pour your yogurt into the filter. 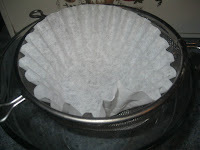 Tie filter closed to form a ball OR do what I did, just place another coffee filter over the top of the yogurt to cover it. 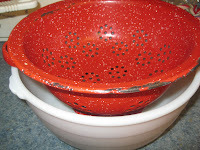 and Place the strainer/bowl in the refrigerator overnight. In the morning, spoon yogurt into an airtight container. Store in refrigerator.